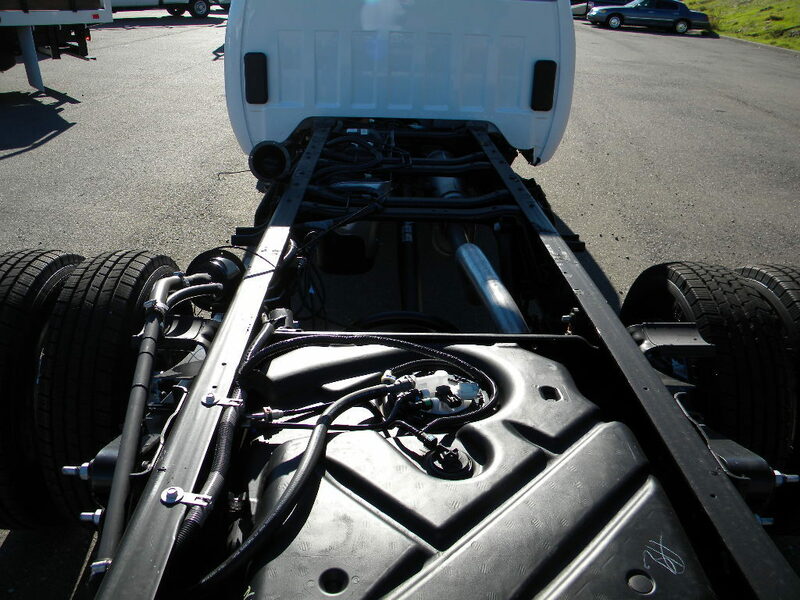 The empty chassis is called a chassis-cab, a cab-chassis, and empty chassis. They all work. This truck is devoid of a body on the back and is then called an empty chassis. On 1-ton and greater capacity chassis, the frame width has been standardized throughout the industry to 34". This truck was never designed from the factory as a completed vehicle. This makes it easier for body companies to build bodies for various chassis manufacturers. On lighter duty trucks, the frame rails are not standardized in this way because these trucks were designed for a pickup box and is available as a pickup box delete option to deliver the chassis to the dealer or body company minus the pickup bed. The GMC chassis cab is available in a conventional cab style (a front end just like a pickup), a cutaway cab style (a front end that is just like a cargo van). The most popular is the conventional cab chassis and on most models it is available in a regular cab, extended cab and crew cab body style. This is available in light duty box delete, and regular cab chassis. The cutaway chassis is very popular for van bodies mainly, although other types of bodies can be used. An example of this is the Knapheide KSV body. The main advantages of the cutaway style chassis are lower entry height, shorter turning radius, and inexpensive maintenance. These are available in 1-ton (3500) and HD 1-ton models (4500). They are also available in several different wheelbases to accommodate body lengths up to 16′. The cutaway chassis is also popular for RV use in motor homes and campers.